La Brea Franklin Apartments is a 40-unit, tax credit property located at the north end of La Brea Avenue in Hollywood, Los Angeles, CA. The waiting list is currently closed. Studios, one, two, three and four bedroom townhouse style apartments are available. There is a spacious community room for resident use, as well as laundry facilities, assigned secured parking, and two outdoor recreation areas. The La Brea Franklin resident community is active in planning building events ranging from baseball outings to potluck dinners. 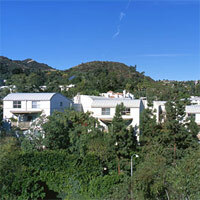 The property is adjacent to Runyon Canyon Park with views from downtown Los Angeles to the Pacific Ocean.